Thai curry has continuously evolved, but what is most important about Thai curry is the curry paste. The complexity in making the curry paste adds to its charm, flavor, and aroma. 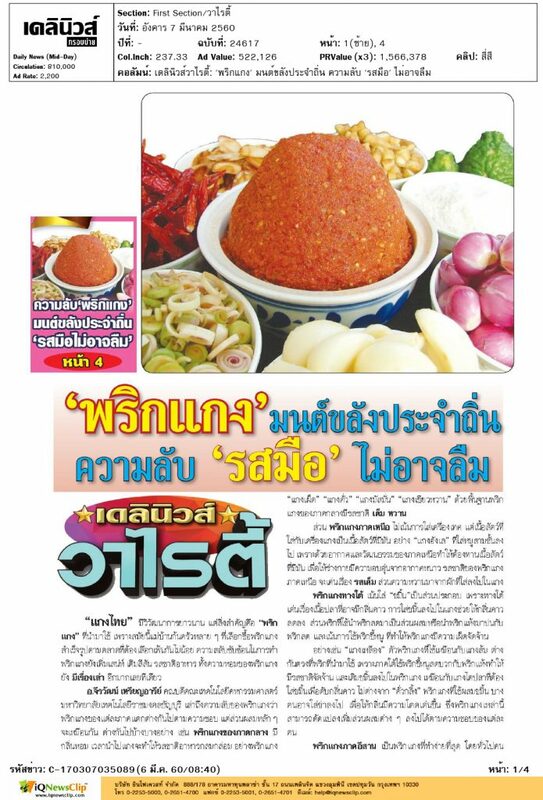 Prof. Jirawat Rianaree, Dean of RMUTT’s Faculty of Home Economics Technology said that the taste of curry paste varies by region. 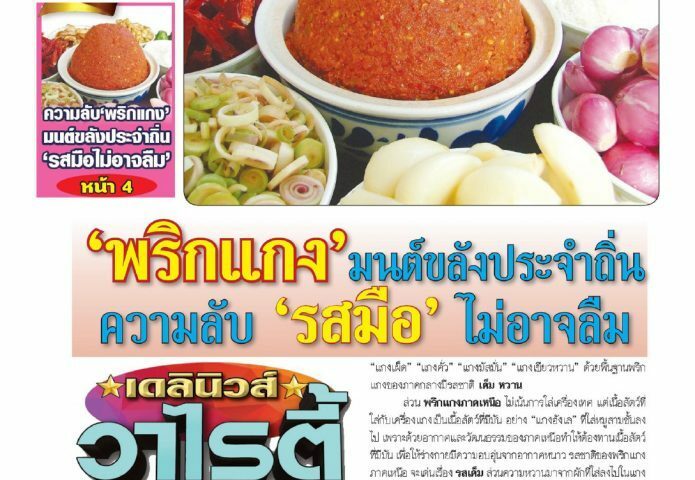 Curry paste in the central region has a salty and sweet taste. Added as base for various curries such as Red curry, Kua curry, Massaman curry, and Green curry results in a balanced and aromatic curry. However, curry in the northern region does not focus on spices. Instead, meat, such as pork belly, is served, such as Hung Ley curry. Meat is used as an ingredient as it helps keep the body warm from the cool weather. Northern curry has a salty taste, with sweetness from vegetables. Moreover, turmeric is an ingredient added into curry from the southern region to decrease fishy odors. Fresh chilis or a combination of grounded fresh and dry chilis, particularly bird’s eye chilis are also used to make the curry spicy. Yellow curry uses the same curry paste as sour curry but contains different chilis. Furthermore, turmeric is added in Gaeng Tai Pla (Southern style fish curry with fermented fish stomach) and Kua Kling (Southern style spicy minced pork with chili paste) to reduce fishy odors. Some recipes also contain galangal to make the smell more prominent. Nevertheless, curries can be modified by adding different ingredients to suit each person’s palate. Northeast style curry is the easiest to make as generally, people in the Northeast region like food that is dry and not very sweet, so northeast style curry is not watery and does not contain a lot of coconut milk. 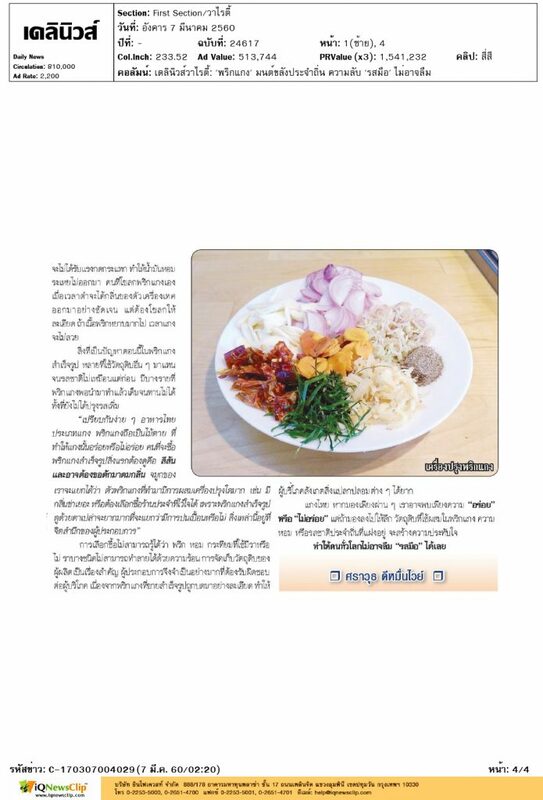 Northeast style curries, such a Dill curry (Gaeng Om), contain fresh curry paste, fresh green and red bird’s eye chilis, and fermented fish. 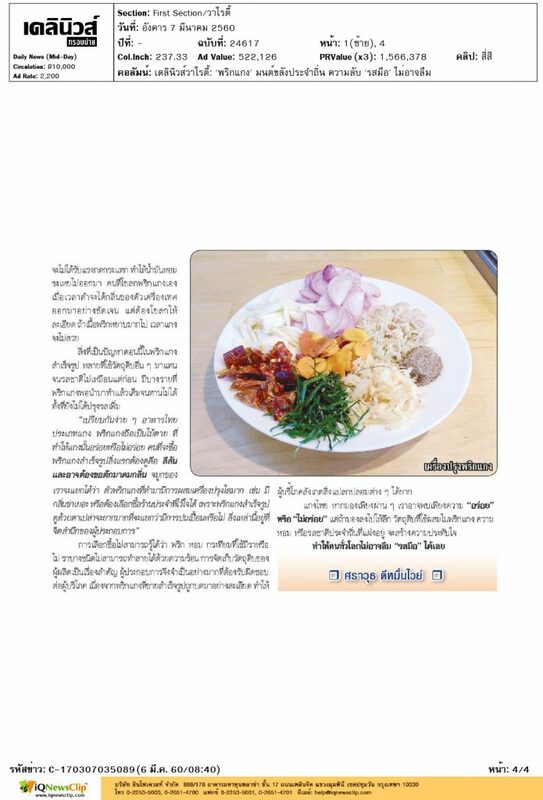 Raw fermented fish must be boiled before being served as it may have various effects to the stomach. Northeast style curries do not contain a lot of spices in the curry paste; besides fish, pork or chicken may be added. Prof. Jirawat Rianaree further stated that curry paste that contains spices is prominent in the central region. Besides curry paste, galangal, lemongrass, kaffir lime skin, coriander root, onion, and shrimp paste are other ingredients that may be added into the curry. Some curry recipes also contain black pepper seasoned to taste. Coriander root, cumin, cardamom, and cinnamon are essential ingredients for Massaman curry. 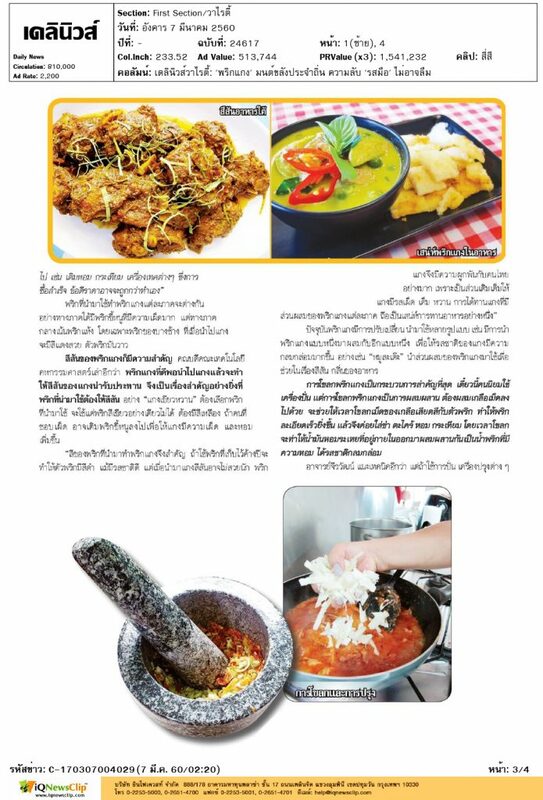 The recipe has been passed on since the Sukhothai-Ayutthaya era until the present day, Furthermore, there are various versions of curry, such as Panang curry, which contains the same spices as Red curry but with an extra ingredient – peanuts. Chili used to make curry paste also differ by region. 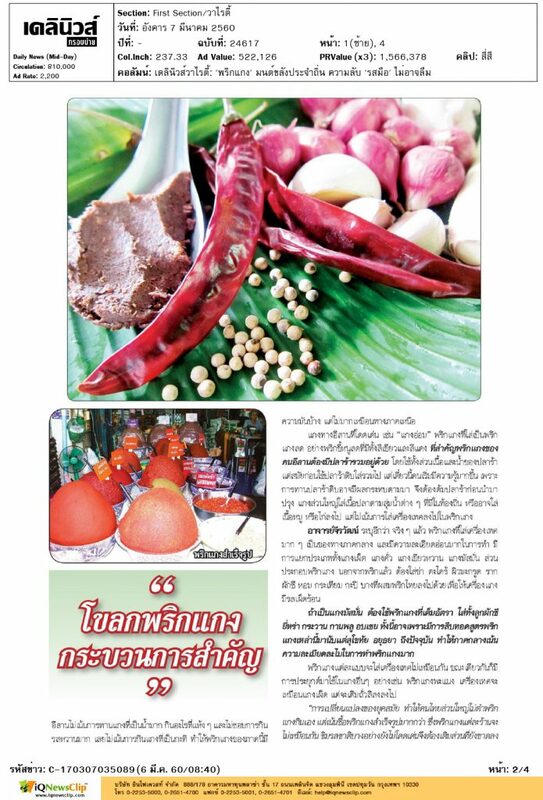 The south region uses bird’s eye chilis, which are very spicy, while the central region uses dry chilis, particularly Bang Chang chilies, which result in a vibrant and shiny red curry. The color of curry paste is important as well. When added into curry, quality curry paste will make the curry more appetizing. For example, yellow curries and green chilis are added to make green curry look appetizing. Those that like their curry spicy and more fragrant should add bird’s eye chilis and onions. The color of chilis is another factor. Chilis that have been kept for a year will turn black. Although it has a good taste, the color of the curry may not be as vibrant. Currently, many versions of curry have been created by mixing various curry pastes, such as Pork Satay, used to add vibrancy and fragrance. The process of pounding curry paste is the most important process in order to create curry paste. Salt tablets must be added, and when pounded, will make the salt and chili more refined due to friction. Galangal, lemongrass, onion, and garlic may be added afterwards. Furthermore, pounding the curry paste will release the ingredients’ oils, which will in turn blend together to create a balanced taste. Prof. Jirawat Rianaree also suggested other techniques. The condiments won’t be blended together if the ingredients were mixed. Subsequently, ingredients’ oils will not be released. Moreover, a problem with ready-made curry is that it contains other ingredients and does not taste like real curry. Some ready-made curries are very salty albeit no added seasoning. The first thing to consider when buying ready-made curry is its color and smell. Our nose is capable of separating ingredients. For example, we would know if a curry paste contains a lot of galangal. One should also buy curry paste from a reliable store as it is hard to distinguish whether curry paste is contaminated or not. However, it is not possible to know whether the curry paste is contaminated or contains molds from chilis, onion, or garlic as some mold may not be destroyed by heat. Thus, it is important to store the ingredients properly. Moreover, some ready-made curry pastes are finely grounded, making it difficult for consumers to notice any differences.